1. Put flour, baking powder, butter, egg, vanilla and agave into a medium size bowl. Work the butter and egg into the flour until resembles by hand. If the dough is too dry, pour a little bit of milk or water over the mixture. Bring the dough together by hand. 2. Form the dough into a disk and refrigerate until chilled. 3. Peel and shred the apples. We can hold them at the core without cutting our hands so keep the core and shred it around. 4. Sprinkle the apples with lemon juice so they won’t go brown. Add the cinnamon and work it together. 5. Get the dough out of the fridge and divide it into two pieces. A bigger and a smaller piece: 1/3 and 2/3. 6. 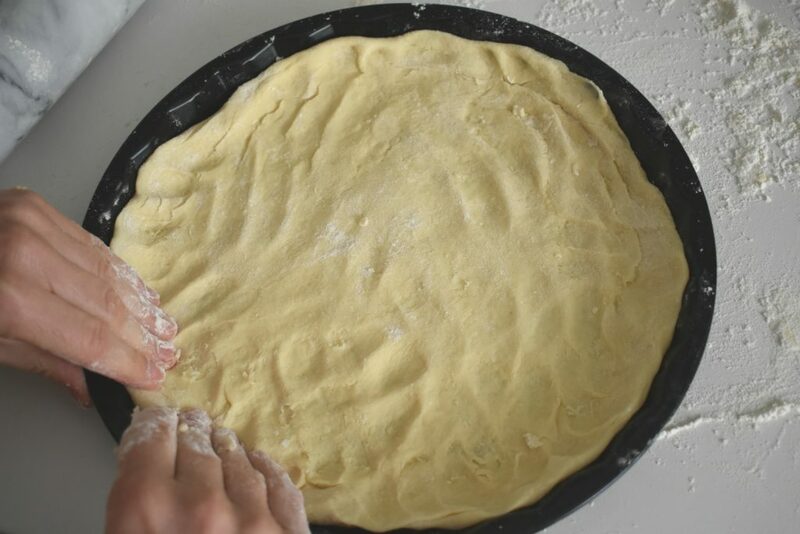 On a lightly floured surface, roll the bigger piece of dough into the form and size of our baking tray. 7. Place disk onto the tray, fit or tweak it if needed. 8. 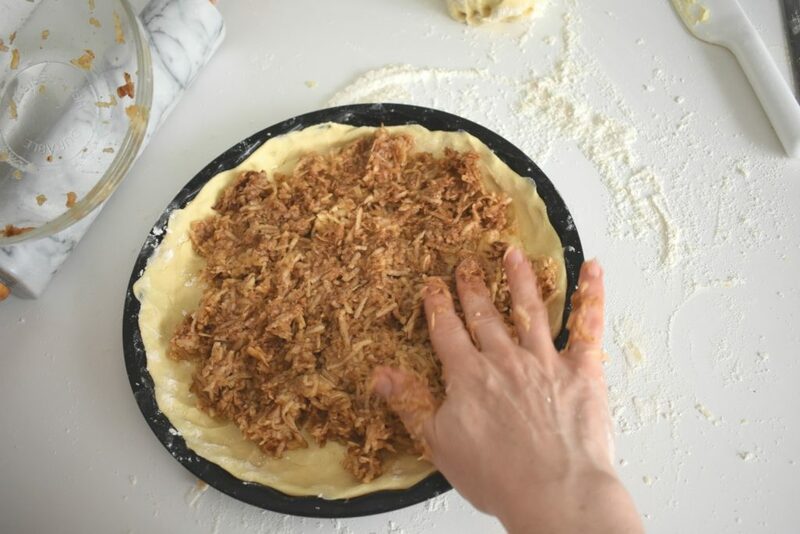 Put the filling on top of the dough. 9. Roll out the smaller part of dough on floured surface. Cut and roll them into strips. 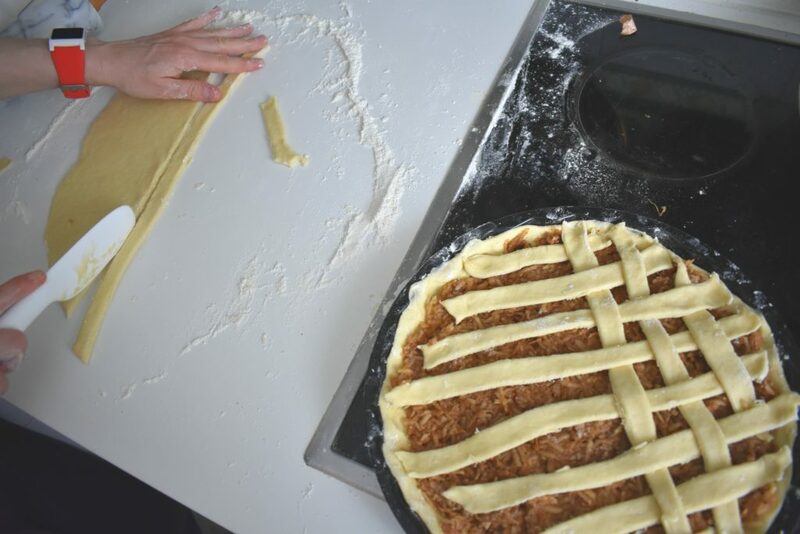 Lay out 4 to 6 parallel strips across pie. Form lattice by arranging another 4 to 6 strips diagonally across first strips. 10. Brush the top with eggs yolk. 10. 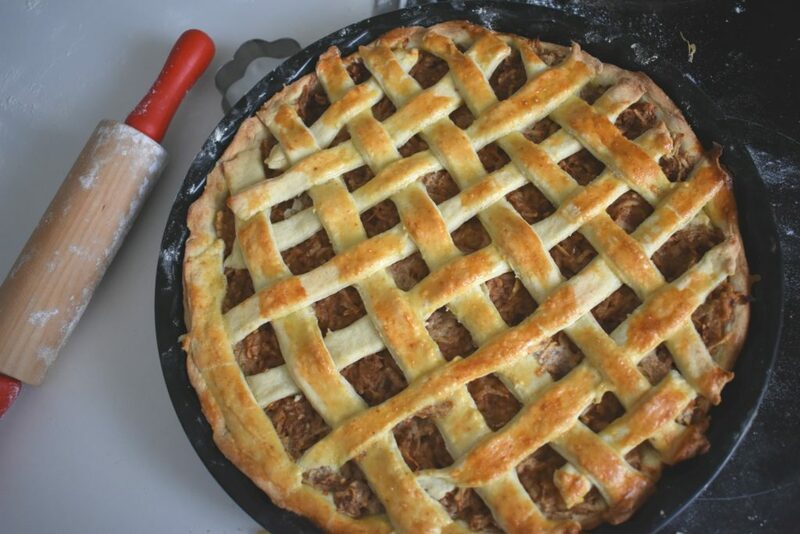 Place apple pie into the 350°F / 180°C preheated oven for about half an hour to bake. 11. Let the apple pie cool down before cutting it up. Put flour, baking powder, butter, egg, vanilla and agave into a medium size bowl. Work the butter and egg into the flour by hand until resembles. If the dough is too dry, pour a little bit of milk or water over the mixture. Bring the dough together by hand. Form the dough into a disk and refrigerate until chilled. Peel and shred the apples. 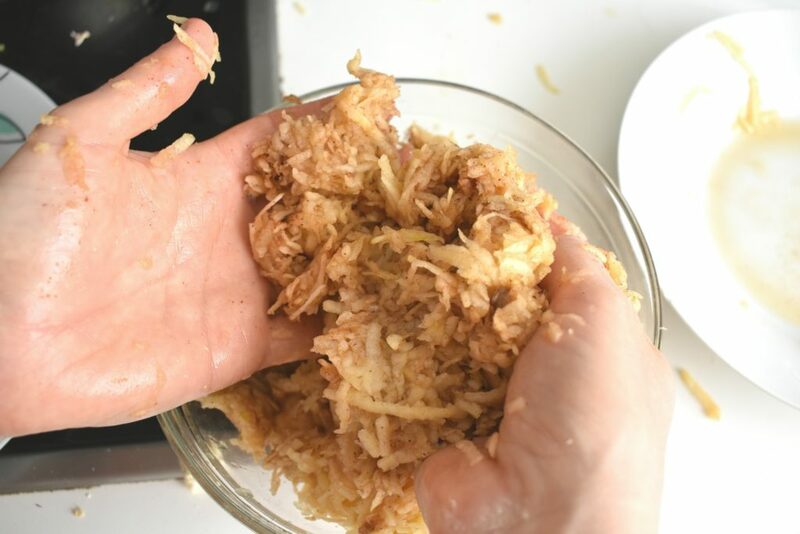 We can hold them at the core without cutting our hands so keep the core and shred it around. Sprinkle the apples with lemon juice so they won’t go brown. Add the cinnamon and work it together. Get the dough out of the fridge and divide it into two pieces. A bigger and a smaller piece: 1/3 and 2/3. 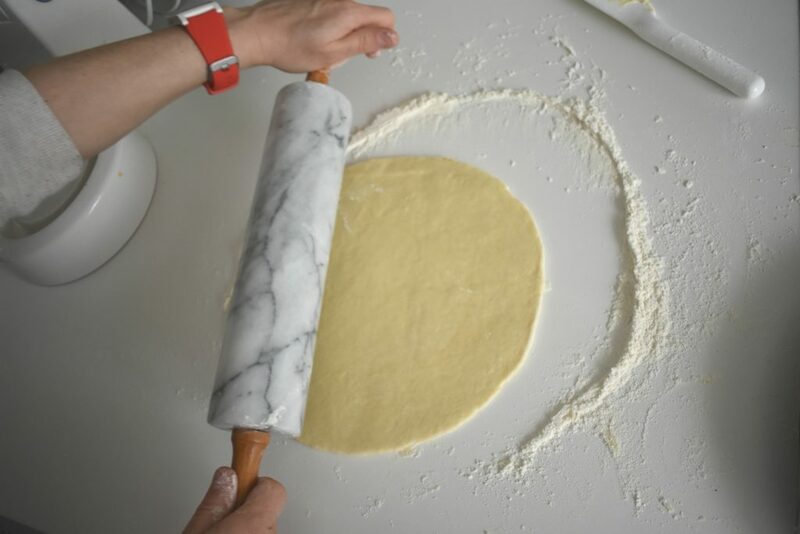 On a lightly floured surface, roll the bigger piece of dough into the form and size of our baking tray. Place disk onto the tray, fit or tweak it if needed. Put the filling on top of the dough. Roll out the smaller part of dough on floured surface. Cut and roll them into strips. 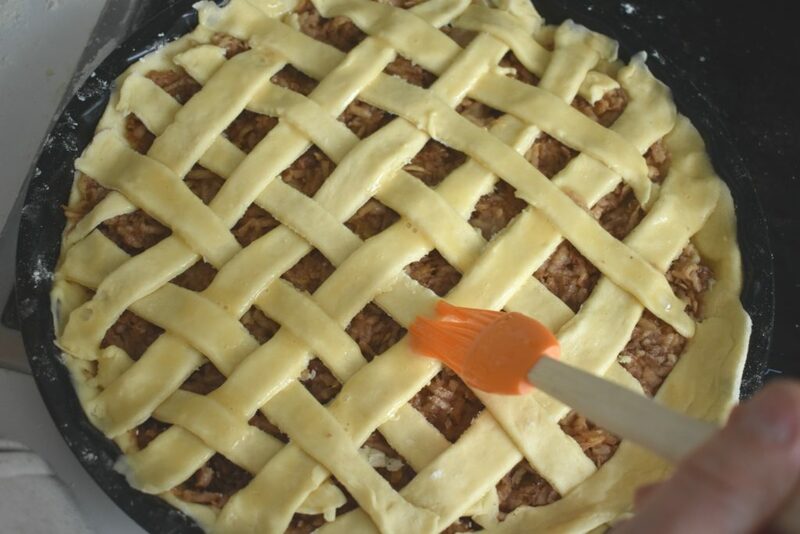 Lay out 4 to 6 parallel strips across pie. Form lattice by arranging another 4 to 6 strips diagonally across first strips. Brush the top with eggs yolk. 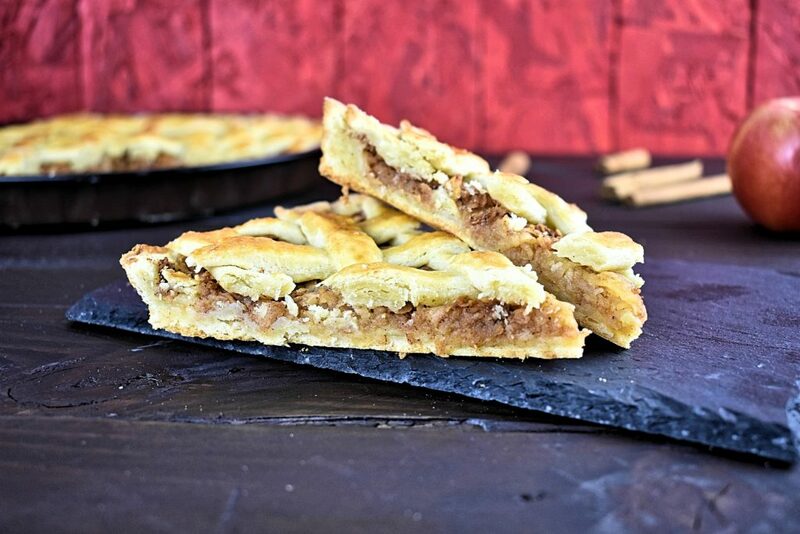 Place apple pie into the 350°F / 180°C preheated oven for about half an hour to bake. 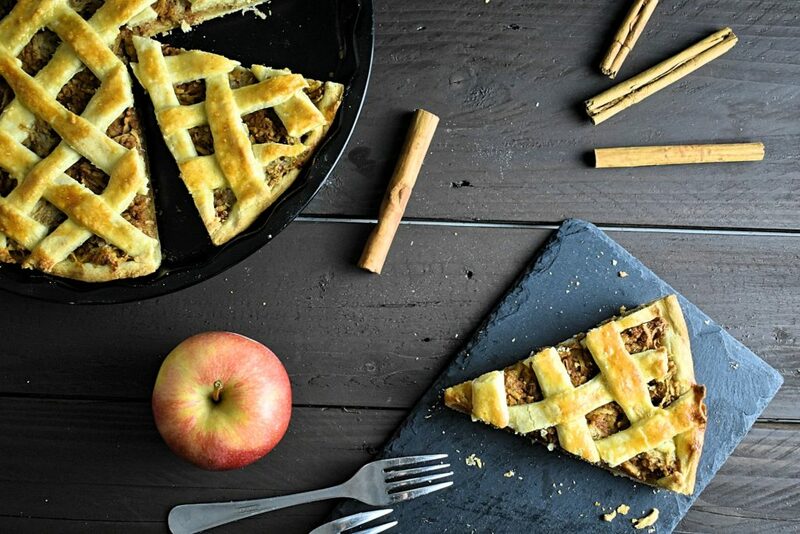 Let the apple pie cool down before cutting it up. 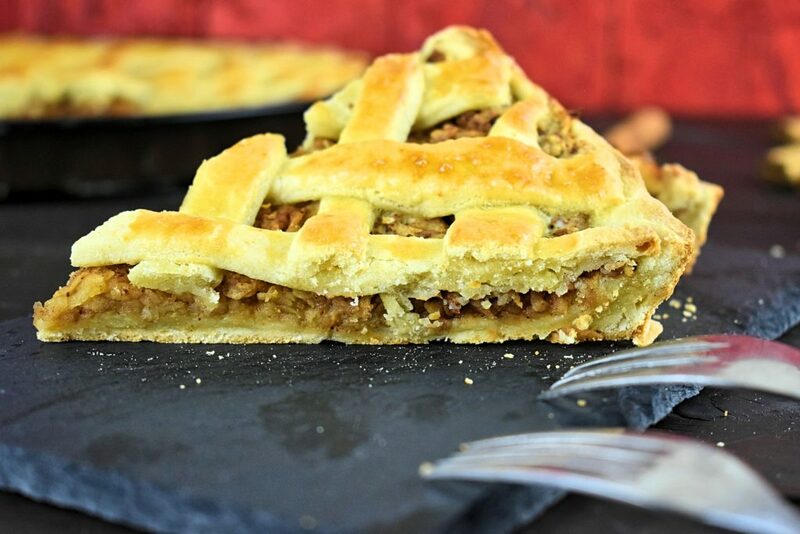 Yes its a perfect recipe for dieties… lovely made apple pie.. It was strange not to pour the sugar in but it absolutely works without it! Superb! 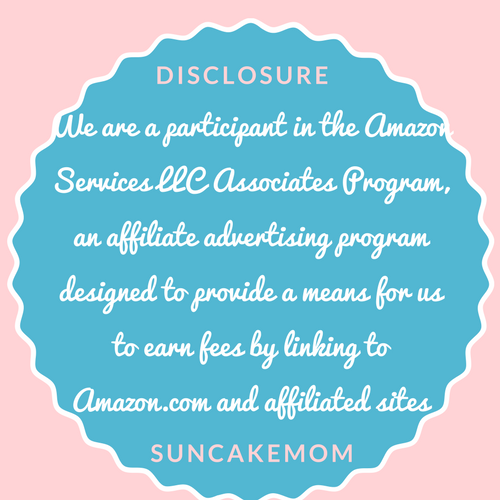 Unbelievable isn’t it! A natural dessert without sugar that simply delicious. 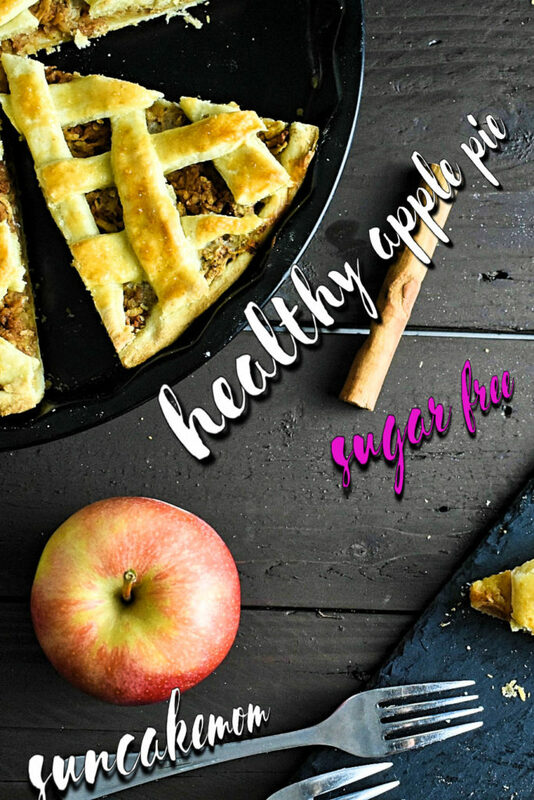 Thanks for this awesome sugar free recipe! My hubby was very pleased even though the pie was without sugar!